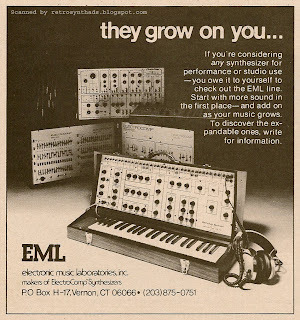 Electronic Music Laboratories, Inc. (EML) 1/3-page ads of its family of products including ElectroComp 101, 200, and 401 semi-modular synthesizers, 300 manual controller, 400 sequencer, and SynKey (model 2001) from page 38 (both) of Contemporary Keyboard Magazine July/August and November/December 1976. Okay, I do realize that I've kinda been obsessing with EML ads lately, but I figure the end-of-the-year holiday season is here and I may as well just finish 'em off and then move on to some other great ads in the new year. This is the third EML ad to appear in Contemporary Keyboard in as many issues. It continued to run for at least the next two to three years - with the only other change being that they sloppily added the 1-800 number after the paragraph of text (see the second image). If you compare this ad to the the previous ad, you will notice some definite similarities. They continued to run with the 'they grow on you' campaign. They also kept the exact same ad copy and re-shot the photo with the same general positioning of the gear - including some patch cords hanging over the lid of the ElectroComp 200. EML did change a few things for the better. They pushed up the brightness of the photo so that you could actually make out the ElectroComp 300 sitting on top of the ElectroComp 401. They also moved the headphones. 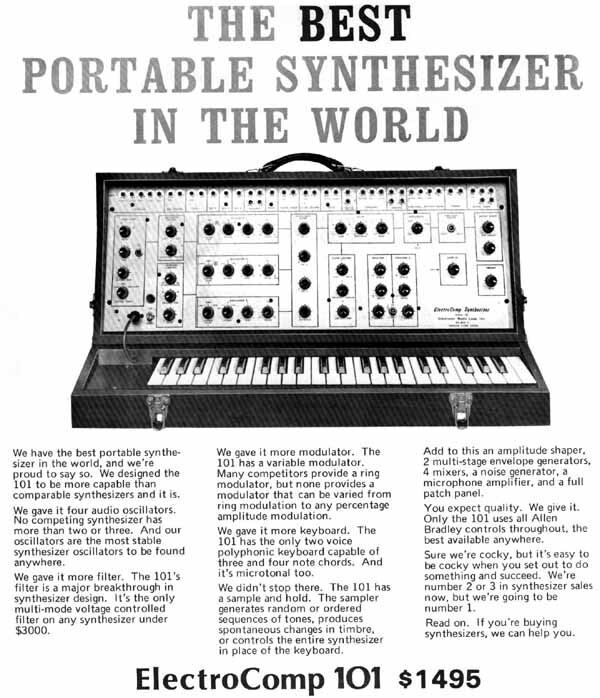 But the big difference is that the gear and ad copy are rearranged a bit to make room for another piece of EML gear - the Model 2001 SynKey synthesizer. 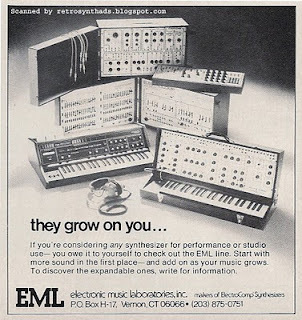 And although I'm glad that EML decided to include another synthesizer in this ad, I am a little disappointed that the ElectroComp 500 synthesizer was not that synthesizer. It could be that the 500 had already been out for a few years, while the SynKey was a newer synthesizer with a whole different look and feel about it. Plus, as mentioned at the end of the previous blog post, EML had just finished blowing some cash on a full-page SynKey ad as well as in a CK contest give-a-way. So, it would kinda make sense to keep running with it. But for some reason, even though I've never owned or played an ElectroComp 500, I feel more of a bond with it. Maybe it is because it reminds me of the white-faced ARP Odyssey with its colouring, shape, and sliders (check out Vintage Synth Explorer to compare both the ElectroComp 500 and the white-faced ARP Odyssey). Or maybe it is because the 500 was the underdog in a battle for synthesizer supremacy dominated by the MiniMoog and Odyssey. But most likely it is because I'm cheap - and the 500 was available for a much lower price than the MiniMoog and the Odyssey. Yeah... probably that. I gotta say, before blogging about these EML ads, I knew very little about EML gear, and I felt like I was playing catch-up. Sadly, Wikipedia has very little on EML in general, and what little is there seem to be incorrect. 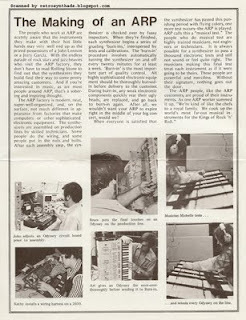 The page says that the company stopped producing synthesizers in 1976. Yet I find this hard to believe considering that EML continued to promote their synthesizers in CK well into 1979. And, in Mark Vail's 'Vintage Synthesizers', one of the founders, Jeff Murray, says that although demand fell off, they continued to make all their existing product line in the latter '70s, while also doing custom work for other companies. Check out some of the other usual online synthesizer reference sites for some good info. One more thing - I still haven't decided whether to post over the rest of the holidays. Keep an eye on the site! 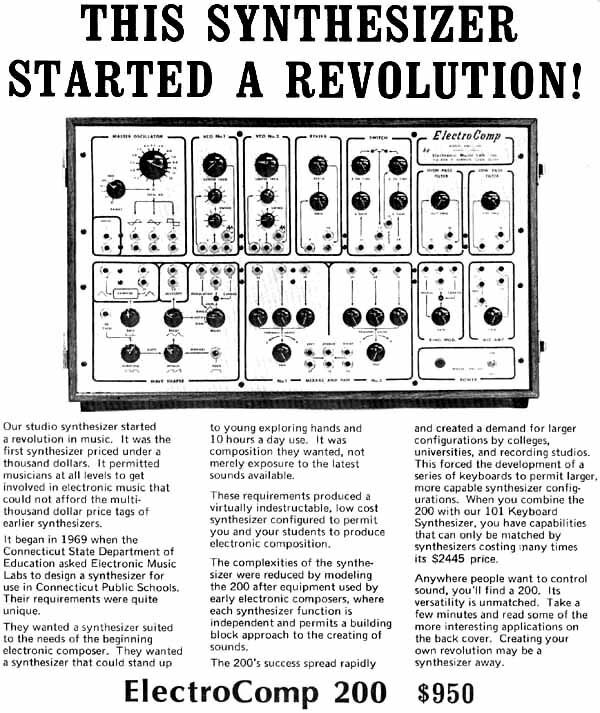 Electronic Music Laboratories, Inc. (EML) 1/3-page ad of its family of products including ElectroComp 101, 200, and 401 semi-modular synthesizers, 300 manual controller, and 400 sequencer from page 37 of Contemporary Keyboard Magazine May/June 1976. This was the second EML ad to appear in CK, two months (one issue) after the initial 1/6-page advertisement appeared in the March/April issue. Gone are the hand-draw fonts, and sadly, that awesome EML logo. Also gone is the 'Stacked' slogan, replaced with the not-so-great "they grow on you...". On the plus side, the font used underneath the logo is rather funky for its time. Also, the larger space (1/3 of the page area) did let EML include much larger photos of the same gear found in the earlier ad - throwing in a pair of headphones and some patch cords to boot. And they even had room to include one more instrument from their line-up. In the murky depths of the image, on top of the EML 401, is an ElectroComp 300 manual controller. Trying to find information on the 300 was like pulling teeth. Reference material for most of the EML line is available at Synthmuseum.com and Vintage Synth Explorer (see my first EML blog post for links to instrument pages), but there is relatively little available online for the 300. I found a good photo of a blue-faced 300, built in 1969, on Sequencer.de (click on the image to enlarge the photo even further), and a photo of a white-faced 300 on OldTech.com. As far as finding online reference information, there is a bit about the 300's microtonal capabilities on microtonal-synthesis.com but I couldn't dig up much else through quick searches with Google. "Alternate controller fanatics take note: Along with a few rudimentary synth components, the ElectroComp 300 manual controller offered calculator-type pushbuttons and pitch knobs. According to an EML product brochure, 'The 300 was originally suggested by a professional composer who wanted to escape from the traditional keyboard with its equal temperament and the patterns it suggests.' 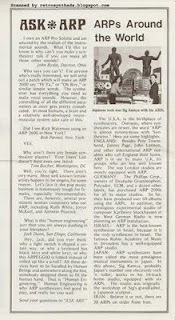 "
An interesting end note: Early issues of Contemporary Keyboard magazine included 'CK Giveaways'. In this issue, CK Giveaway #5 was an EML SynKey. 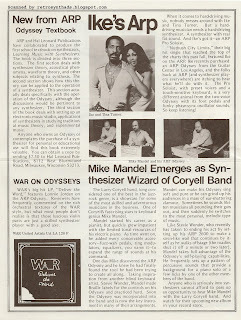 This is probably why this issue of CK also featured a rare full page EML Syn-Key advertisement. Electronic Music Laboratories, Inc. (EML) 1/6-page ad of its family of products including ElectroComp 101, 200, and 401 semi-modular synthesizers and 400 sequencer from page 30 of Contemporary Keyboard Magazine March/April 1976. This was the first and only time that I can recall that this particular EML ad ran in CK. It was replaced in the following issue of CK with the much more popular 1/3-page ad that used the 'They grow on you" slogan. And I know you can guess the number one reason I love this ad: THE LOGO! I could not recall seeing this version of the EML logo anywhere - on paper or gear - so I did a quick Google search and it didn't bring up anything even close to it either. Can anyone tell me if this logo ever graced any piece of EML equipment? The hand-drawn fonts used in the ad are also interesting, vaguely reminding me of the older Sequential Circuits 'Prophet' font that started to appear around 1977-78. But, I have to admit I'm not that familiar with EML synthesizers, probably because of my limited exposure to the instruments themselves. And I bet other innocent eyes were more likely to focus on the full page ads that larger companies like ARP, Oberheim, and Moog were putting out at the time, and not the smaller ads that were usually allocated to the back-half of the magazine. EML did spend a wack of cash on a full-page ad for the SynKey that appeared in the following issue, but that ad was just as rare as this one - and didn't seem to appear in later issues of CK. And that is unfortunate, because I think more people would have liked EML had they been able to have access to them. Looking at information I could find online, they definitely looked like well-built tanks and were apparently much more affordable than comparable Arps and Moogs. 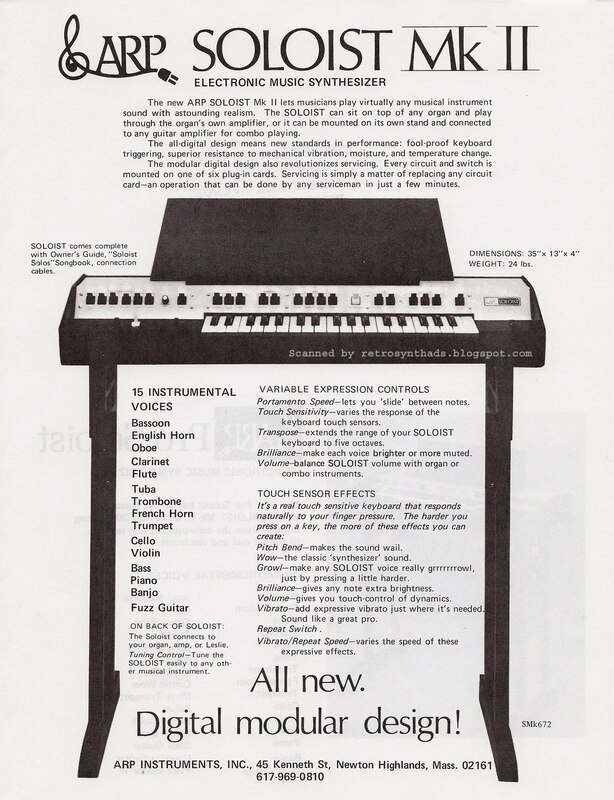 But, according to Mark Vail's 'Vintage Synthesizers' book, EML made some bad decisions in the mid-70's and in the end they couldn't compete with the 'onslaught of synths from Yamaha and other Japanese manufacturers'. For more information on EML synthesizers, check out some of the usual online synthesizer haunts. Vintage Synth Explorer has pages for all the instruments including great images: ElectroComp 101, ElectroComp 200 and ElectroComp 400/401. Synthmuseum.com also has some great information on the 101, 200, and 400 - including links to some excellent brochures for the 101 and 200 courtesy of synthesizer technician Kevin Lightner. 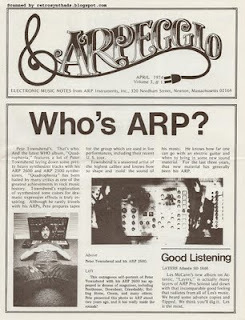 ARP Arpeggio Newsletter from April 1974, Volume 3, #1. And so, this is one of 'em! I've provided the images of each page above - in the order you would read them in. So, if you received the newsletter in the mail, you would have unfolded it, then read the front cover first, then opened the cover to reveal the three pages on the reverse side (the last of which is a three-quarter page! ), and then you would flip back to the first side and read the last two pages (the other side of the three-quarter page and then the last page). Confused? I've also supplied the PDF where I've stitched the images together as if they were the two sides of the newsletter - so, not in order, but if you printed it out on two sides of the same piece of paper, you could fold it up like the original newsletter. A fun project during a slow day at the office. 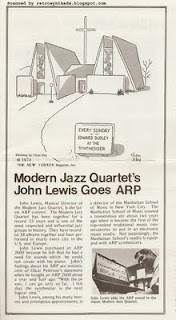 You didn't know that Phillips Corp. bought ARP 2500s for all it's major studios? Now you do! You didn't know that there were 38 ARPs on order for Iran in 1974? Now you do! You didn't know that famous photo of Peter Townshend laying in front of his ARP 2600 was a self-portrait taken around 1972. Now you do! Somehow, somewhere, they mention the term 'Human Engineering'. "What is this "human engineering" jazz that you are always pushing in your literature? - Jack Dunn, San Diego, California"
And the answer to the question explains "Human Engineering" pretty well. "Hey Jack, did you ever think why a light switch is shaped a certain way, or why a keyboard has black keys and white keys, or why this ARPPEGGIO is folded instead of rolled up like a scroll? All these devices have to be handled by Human Beings and somewhere along the line, somebody designed them to fit the human hand. That is "Human Engineering." 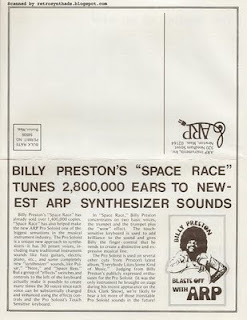 Human Engineering is why ARP synthesizers feel good to play, and really let you wail." I wonder if Jack Dunn still uses the word 'jazz' a lot? 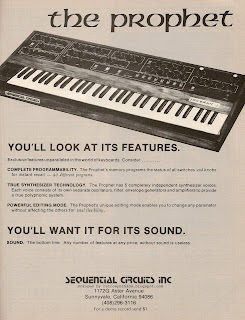 Sequential Circuits Inc. Prophet-5 synthesizer ad from page 75 of Contemporary Keyboard magazine, November 1978. My thinking is that this ad was a stop-gap measure between the first Prophet ad that ran in CK from February to July 1978, and the new colour Prophet ads that didn't start running until early 1979. That would have been six months of silence from SCI, and I think they realized that they needed to include something in the popular pre-Xmas November issue of CK, and rather than use the original ad, this is what they came up with on short notice. 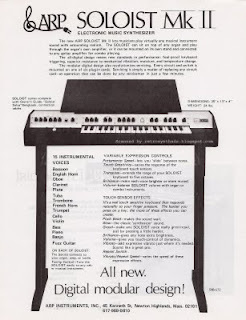 The Prophet-5 page in the article includes some great reference information and quotes from Dave Smith that helps sum up what was happening in the industry at the time. "We wanted to answer two of the main complaints people seem to have about synthesizers, one being that they're too hard to use live and the other being that they can't be used to play chords." "Using the computer is more cost-effective"... "It enables us to do quite a few things that we couldn't have done without it. The edit mode, for example, was added as an afterthought. It was done totally with the software. All I did was change the program. I didn't have to add any circuitry at all. By simply changing the program we sudden had an edit mode." "From what I can tell, everybody likes the wheels. The other alternative to them is to do what ARP and Oberheim and CAT (Octave Electronics) have done, which is try to build something that's different just to be different. Then people probably won't like it. So I figured, I'm not proud. I'll put exactly what people want on it. We even designed it to match the Minimoog's almost exactly. The idea was to get something familiar. That idea carried over to the whole front panel. We wanted something that people could understand almost immediately." Dave also comments on his relationship with Emu, interfaceability (their words, not mine), and the new double-keyboard 10-voice Prophet to appear sometime in 1979. And that's just the Prophet-5 page. There are a number of pages dripping in history - including Tom Oberheim providing great background on the Four-Voice, Dave Rossum and Scott Wedge waxing on Emu, and Dave Friend chatting about the Quadra. So, what about Part 1? That was also written by Dominic Milano in the April 1978 issue of CK, but it was much shorter and contained more general information on the polyphonic keyboards around at the time. Still a great read, but as far as I'm concerned, nothing compared to Part 2. I wish I could keep on typing, but my stomach is really growling... I need a veggie burrito, pronto! 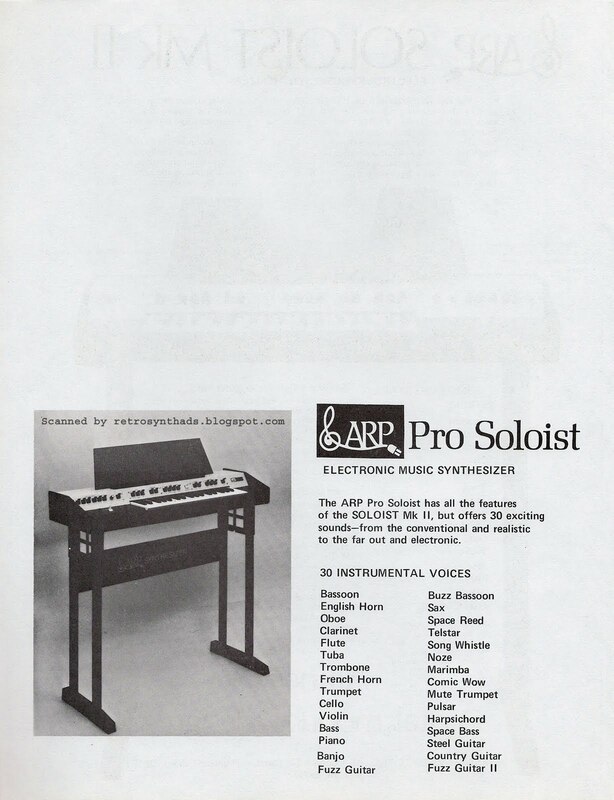 ARP Soloist Mk II dealer ad sheet (front and back) from the 1970s including the Soloist Mk II and Pro Soloist. It was only a week or two ago that I had never heard of the Soloist Mk II. I blogged about how little information there was on the Web about it - just a few forum comments. It's like the sasquatch of the online synthesizer world. The Bobby Fischer of Analogue Heaven. The Jimmy Hoffa of Vintage Synth Explorer. "The modular design also revolutionizes servicing. Every circuit and switch is mounted on one of the six plug-in cards. Servicing is simply a matter of replacing any circuit card - an operation that can be done by any serviceman in just a few minutes." Now I just need to find the time to type all that into Wikipedia or one of the great synthesizer sites out there like VSE... any suggestions on what synthesizer site(s) to contribute to?